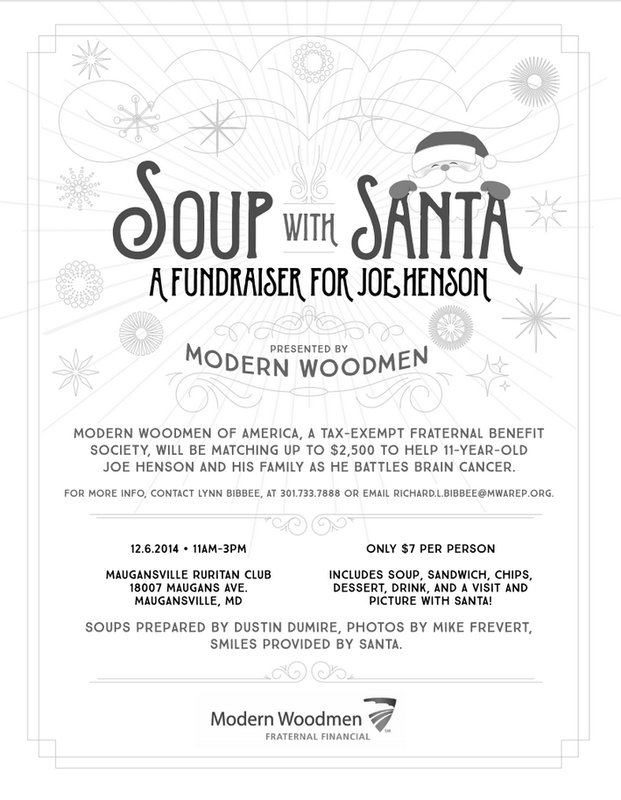 MAUGANSVILLE, MD - Modern Woodmen of America Chapter 6118 members from Hagerstown, MD and Martinsburg, WV will sponsor their 2nd Soup with Santa fundraiser on December 6th, 2014 to benefit Joseph Henson, a local 11 year old who is fighting brain cancer. Joe Henson is a local 11 year old boy fighting brain cancer. Joe and his mother Angela have been at Johns Hopkins hospital since June 26 when he was airlifted from Meritus Hospital. Joe had surgery just three days later to remove as much of the tumor as they could. He has undergone six weeks of radiation therapy and currently continues chemotherapy. Joe has had a really hard time post-op and still has not regained many functions you and I take for granted. Joe misses his brother and sisters, who are staying with his grandmother in Williamsport. It's been a tough road the past few years, as Joe lost his father Chris 3 years ago to a car accident. Plans for the fundraiser include: Soups (by Dustin Dumire), a sandwich, chips, a dessert, a drink, and a visit and e-photo with Santa Claus (with your camera or by Photographer Mike Frevert). The Modern Woodmen will also have Silent Auction items to bid on, and Raffle ticket sales. The event will run from 1 AM to 3PM, on Saturday, December 6th at the Maugansville Ruritan Club located at 180 7 Maugans Ave., Maugansville, MD 21740. For more information, please visit the Facebook event page.